WEDNESDAY, June 28, 2017 (HealthDay News) -- A dramatic decrease in often-fatal cardiac arrest has occurred among Oregon residents who gained access to health insurance through the Affordable Care Act, a new study reports. Cardiac arrest cases declined by 17 percent among 45- to 64-year-olds soon after full implementation of the health care legislation in 2014, the researchers reported. This decrease likely occurred because doctors detected warning signs of heart disease and prescribed effective treatments that lowered patients' short-term risk of cardiac arrest, said lead researcher Dr. Eric Stecker. For example, doctors can dramatically reduce cardiac arrest risk by prescribing statins and daily aspirin to people with clogged arteries, said Stecker. He is an associate professor of cardiovascular medicine with Oregon Health & Science University. The observed reduction in cardiac arrest is a "surprising and very positive sign," said Mary Fran Hazinski, a professor of trauma and surgical critical care at Vanderbilt University School of Nursing in Nashville. "Several studies have documented a decrease in mortality when health care coverage is expanded, but typically the decrease is in the range of 2 to 6 percent," said Hazinski, co-author of an editorial accompanying the new study. "A 17 percent reduction in out-of-hospital cardiac arrest is a pretty extraordinary reduction," she added. Hazinski said these results show that more people will die if the Republican-led Congress passes its plan to repeal the Affordable Care Act (ACA), also called Obamacare. The Congressional Budget Office has estimated that 22 million Americans will lose their health coverage with the health care bill under consideration by the Senate. "Back-of-the-napkin" estimates based on these new findings indicate about 37,400 people out of those 22 million will die from sudden cardiac arrest during the next decade because they won't receive life-saving treatment for undetected heart problems, Hazinski noted. "The number of lives saved by the Oregon health care system is exceptional and extraordinary, and eliminating that kind of health care would result in a significant increase in lives lost," Hazinski said. Cardiac arrest occurs when the heart's electrical system malfunctions, causing the heart to unexpectedly stop beating. The victim becomes unresponsive within seconds, and death occurs within minutes without emergency treatment such as CPR, according to the American Heart Association (AHA). Each year in the United States, more than 350,000 cases of cardiac arrest occur outside of a hospital, the AHA says. Journalist Tim Russert and filmmaker John Hughes both died from sudden cardiac arrest, researchers said. Cardiac arrest typically strikes without warning and has a very high mortality rate, Stecker said. Because of this, prevention is key. The research team focused on the Portland metropolitan area. Stecker and his colleagues used EMS (emergency medical services) records to identify Multnomah County patients treated for out-of-hospital cardiac arrest. The investigators then compared the information to census data for the pre-ACA years of 2011-2012 and post-implementation years of 2014-2015. Uninsured rates in the county dropped by half following ACA implementation, from nearly 16 percent to lower than 8 percent, the study authors said. 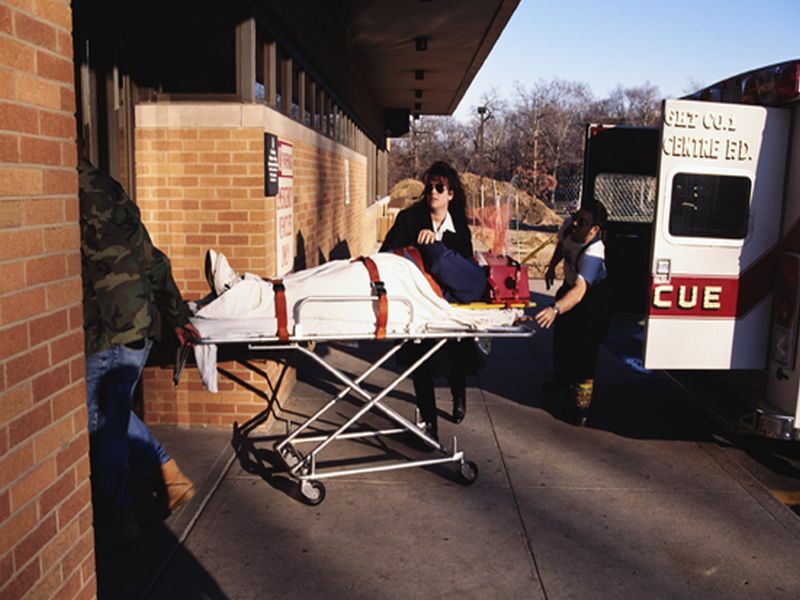 Sudden cardiac arrests declined among middle-aged people while insurance coverage expanded. There were 102 cardiac arrests for every 100,000 people in 2011-2012, compared with 85 cases per 100,000 following full implementation of the ACA, the findings showed. However, cardiac arrest rates remained stable among residents 65 and older. "The difference was that people over 65 have near-universal access to health care through Medicare," Stecker said. The study can't prove the health care law led to fewer cardiac arrest cases. Still, Stecker thinks access to preventive care is the main reason cardiac arrests dropped so suddenly during such a short time-frame. "If a person has insurance, I've found in clinical practice they're more likely to come in for evaluation, and sometimes that evaluation shows unrecognized high-risk heart disease for which we can initiate treatment," Stecker said. "Some of these treatments can affect outcomes on a short time-frame, just 24 to 48 months," he added. Cardiac arrest cases could decline further as patients with access to health care take more medium- and long-term steps to improve their heart health -- by taking blood pressure medication, adopting a healthy diet, exercising regularly, losing weight and avoiding smoking, Stecker suggested. Oregon's eager embrace of the ACA also might have fueled this dramatic decline, Hazinski added. "Oregon not only provided expanded Medicaid coverage, but also improved the health care delivery system and the quality of health care delivery," Hazinski said. "They focused on delivering health care that met published guidelines and were monitored for both quality and cost effectiveness by regional coordinated care organizations," she continued. The result, she said, was an "extraordinary reduction in the incidence of cardiac arrest." The findings were published June 28 in the Journal of the American Heart Association.